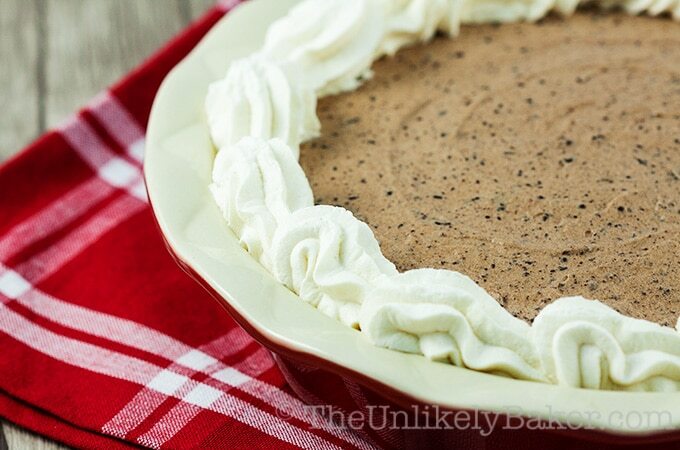 This Baileys chocolate mousse pie is rich and creamy with delightful specks of chocolate all throughout. It’s fast and easy to make too, no oven needed! No gelatin or eggs in the ingredients either. Two things are happening this week: St. Patrick’s Day and my brother’s birthday. And I have the perfect dessert for both – it’s chocolatey (for my brother), made with Baileys (hooray for St. Paddy’s) and no baking required (this one is for me). 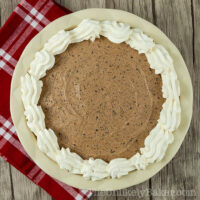 This no-bake Baileys chocolate mousse pie is rich and creamy with delightful pieces of chocolate in every bite. It’s very easy to make too. 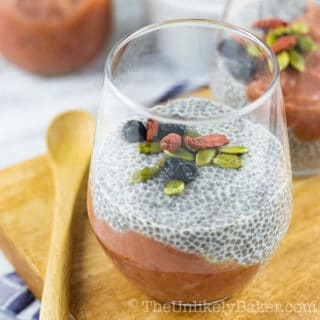 Perfect for St. Patrick’s Day if you don’t want to go the green dessert route and for brothers who have the sweet tooth (and appreciate a boozy dessert!). Irish cream is a cream liqueur made of Irish whisky, cream and, depending on the recipe or the brand, other flavours like chocolate, coffee, vanilla and even caramel. There are several brands out there but looks like Baileys is the most well-known. It’s what I use for all my Irish cream dessert recipes here on TUB, though you can most certainly use other brands, or even make your own! Marisa over at All Our Way has this delicious recipe for homemade Irish cream if you want to give it a try. 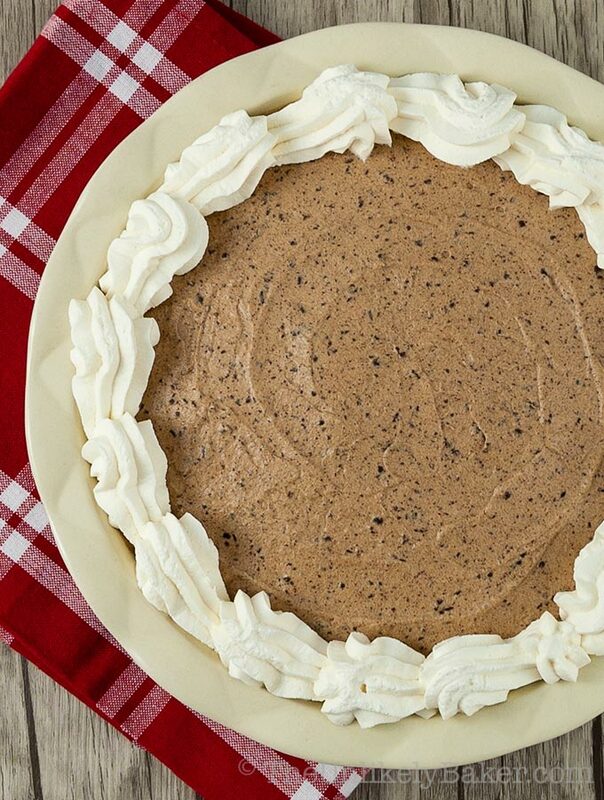 This Baileys Irish cream mousse pie might just be the easiest pie you’d ever make. First it’s no-bake. That’s always a plus! 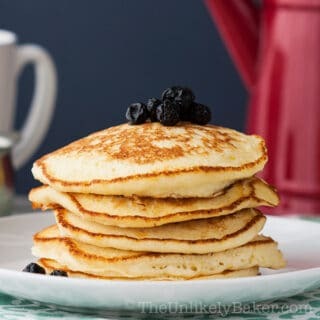 There’s also no gelatin in it for those of you wary of using gelatin in your recipes; instead, you achieve that creamy texture by whipping the heavy cream stiff (but still glossy). Unlike traditional chocolate mousse, this recipe has no eggs in it. No eggs, no double boilers, no cooking, just whipping! Easy, right? Preparing the filing is similarly straightforward – whip the heavy cream to almost medium then slowly drizzle the Baileys until you reach medium-stiff peaks. Mix a little of your cream with your melted chocolate to create a delectable fudgy mixture. Add back your chocolate, chunks at a time, into your cream and continue mixing. The chocolate will break apart into little specks of deliciousness as you do this. When everything is incorporated (and your cream is holding its shape), transfer to your pie dish and chill overnight. would make life that much more easier just because your cream would whip faster. For the best whipped cream, make sure everything is chilled. This means your cream, your bowl, your beater/whisk and even your Irish cream. I usually put them in the fridge at least 30 minutes before I plan to use them. Can I use ready-made whipped cream? You most certainly can. Though I encourage you to try and make your own whipped cream. It really is the easiest thing in the world (only takes 15 minutes max!) and taste 1000% better than store-bought. Can I use ready-made Oreo crust?
. Just note that the batter generously fills a deep, 9-inch pie dish so you may want to buy two Oreo crusts. Use Irish cream liqueur that you would drink. It’s like cooking with wine – only cook/bake with wine/liqueur that you’d actually drink. Especially that the Irish cream is the star of this pie show, it must be something you actually love. Why is my melted chocolate seizing? When you mix the cold cream to your warmer melted chocolate, the chocolate will seize and that’s ok. This is because the cream is cold and the chocolate is warmer. Don’t worry, the chocolate will break apart when you mix it back into the rest of the cream and this is how you get those yummy specks of chocolate. My pie did not set. 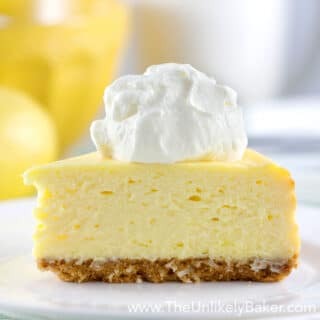 Note that this pie will not set as firmly as, for example, a no-bake cheesecake. But it should hold its shape when you slice into it. If it does not, it probably needs to chill more or if it has already chilled overnight, the cream may not have been whipped properly.
. It will look pretty and still taste amazing. 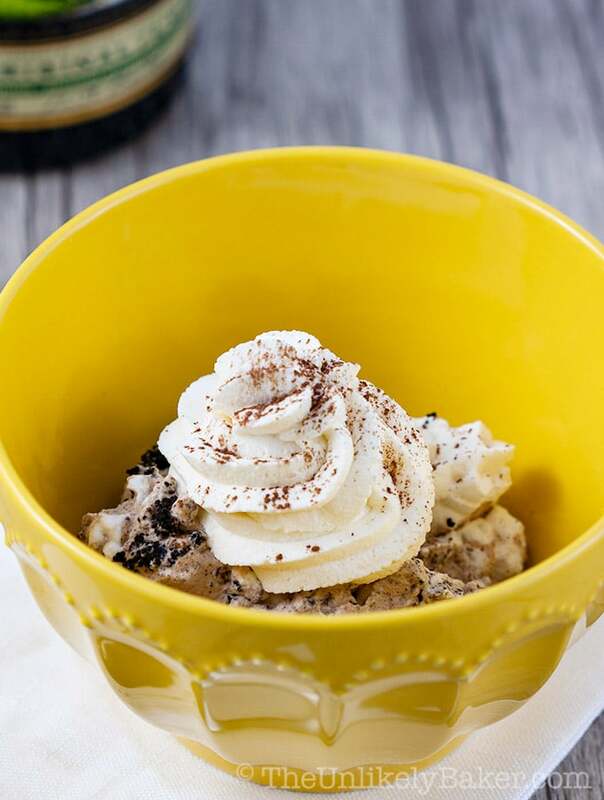 A scoop of this pie is pure Irish cream and chocolate bliss. 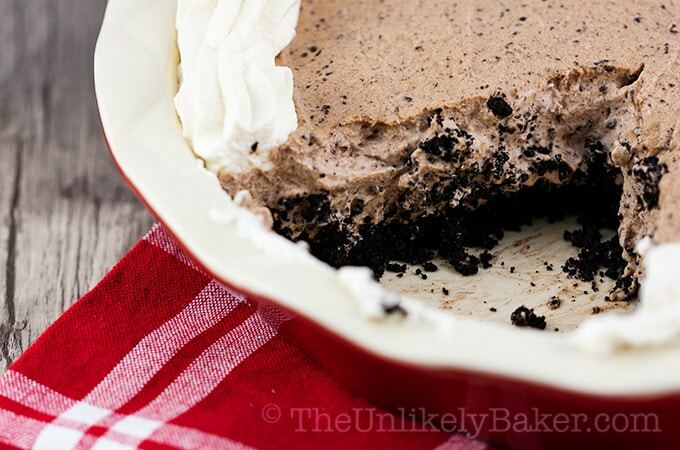 The Oreo cookie crust lends a slightly bitter dark chocolate taste that balances off the sweetness of the mousse. But my favourite parts are the bits of chocolate you get with every spoonful – they add great texture and flavour. 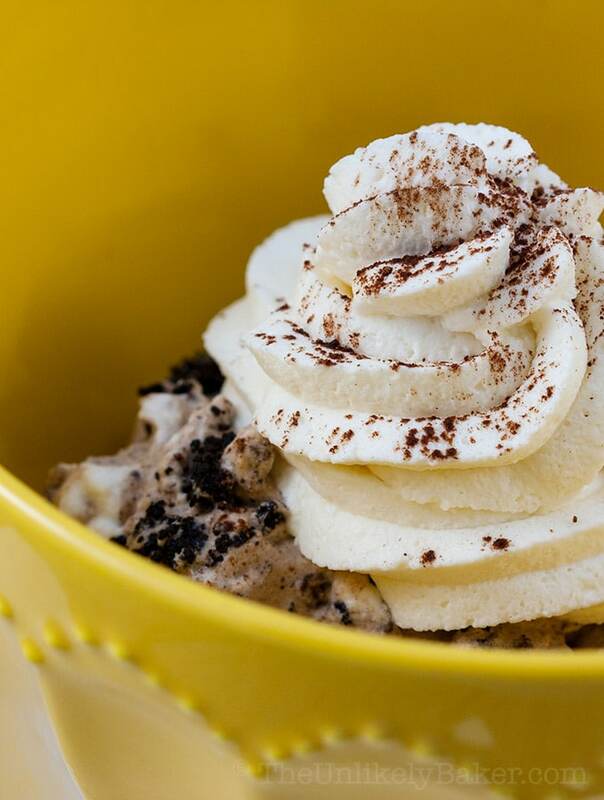 Top it with whipped cream and you’re all set! It’s indulgent, easy to make and (no lies) might make you a little woozy (which is not a bad thing). 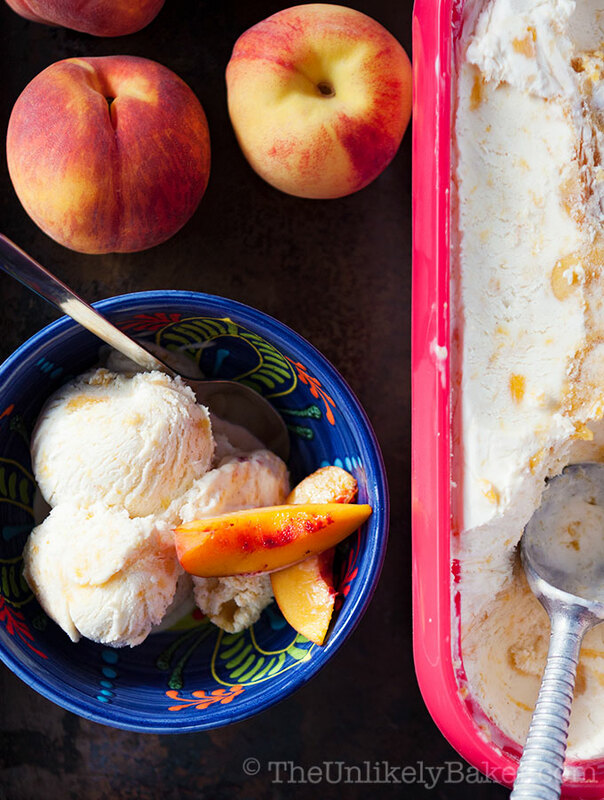 Love boozy desserts? Here are other recipes you can try. This first one is bread pudding that’s made with Kahlua. 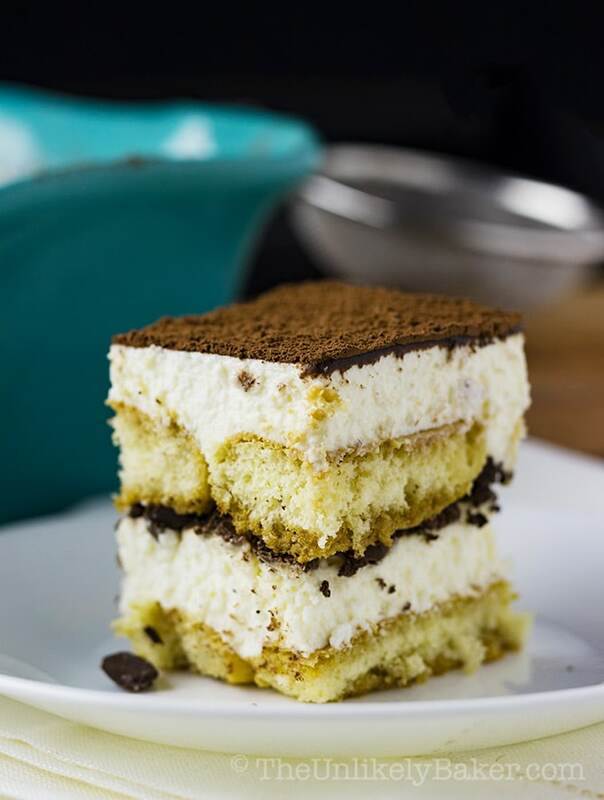 This eggless tiramisu has Kahlua as well. Mix 1 1/4 cups cookie crumbs, 1/4 cup melted butter and a pinch of salt until evenly moist and crumbly. Press onto the bottom and sides of a 9-inch pie dish. Then put the dish in the fridge to allow it to set a little while you're preparing the mousse. Using a handheld electric mixer or a stand mixer with the whisk attachment, whip 2 cups heavy cream on high speed until almost medium peaks. Gradually drizzle 1/2 cup Baileys. Mix until incorporated well. In a separate bowl, mix your melted chocolate with about 1/2 cup of your whipped cream mixture to temper it. Stir until well combined. You will notice that, since your cream is cold and your chocolate is warm, your chocolate will be harder and harder to mix and will turn a little fudgy. That's ok. Mix back your chocolate mixture, chunks at a time, into your whipped cream. You'll notice that as you start whipping, the chocolate will break into little pieces. And your mixture will be coarse and grainy - that's ok too. Just mix until everything is fully combined and until your cream starts to hold its shape. Pour the Baileys mousse into your prepared pie crust and refrigerate overnight. Slice or scoop into a bowl, top with whipped cream and dust with cocoa powder to serve. Did you make Baileys chocolate mousse pie? I’d love to hear from you in the comments section below. You certainly are making me drool!! I can’t believe how easy it is to make and don’t even ask if I like Irish Cream!! We love it! That stuff is sooo good we want to nip on it every night. Now, adding the flavor to a chocolate mousse. That is simply heavenly!! 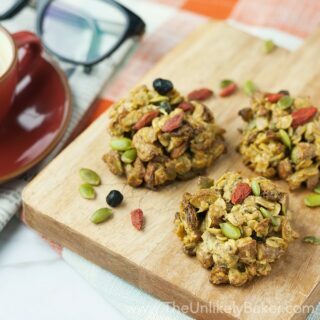 Love Baileys and this is such a lovely no bake option. Surely delicious and cant wait to try one. I love chocolate pies and hardly ever make them for myself or my family. Your recipe looks really easy to follow with the helpful tips as well. Thanks! Oh my it’s only 7 am and I want to eat this whole thing! 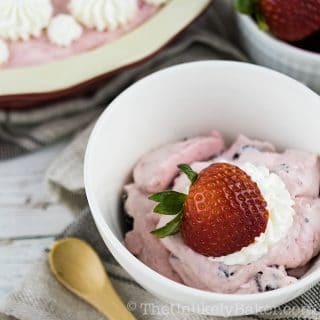 It looks so creamy and delicious and only 6 ingredients! 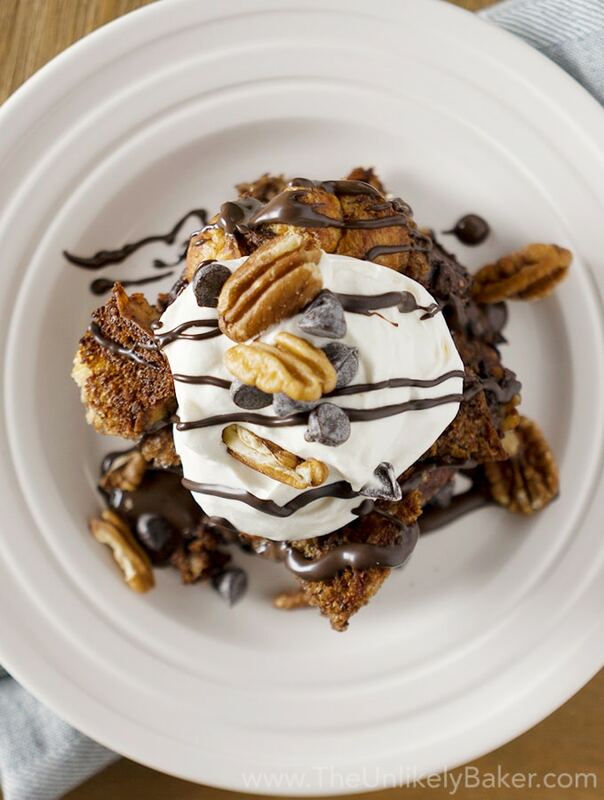 This sounds like the perfect dessert to celebrate St. Paddy’s day. I would serve it ALL year long. Great to take to a party …. or serve at brunch. Give me anything chocolate and I am sold, this looks so yummy! Plus, this is easy, no bake and boozy! Nothing not to like eh? 🙂 Thanks Kusum! Ikr?? Love the easy stuff. I mean, I’m all about learning but sometimes we need easy recipes to tide us over haha. Thanks Catalina! Happy Sunday! Okay, im absolutely sold right now, it looks delsh, and is midnight I would die for it haha. Nothing to not like about it right? Chocolate, booze, no bake 🙂 Thanks Anna-Maria! Hope you get to make this pie soon! Yes! This looks so amazing! We’re entertaining for the holiday next weekend so I’ll definitely try yo give this a go! Awesome! Hope you and your guests like it 🙂 Thanks Anna! Wow this looks delicious, have you considered making videos? I watch tasty on fAcebook all the time and feel your recipe should be trending. I’m going to show my boyfriend and see if he wants to make this tonight. Hi Kenia. Thanks for the suggestion. I know I should…maybe when I get better at baking. Right now I don’t think it will help posting a video of the chaos that is our kitchen when I’m baking lol. It looks so tempting and delicious that I feel like putting my hands inside the laptop and grabbing it right now. 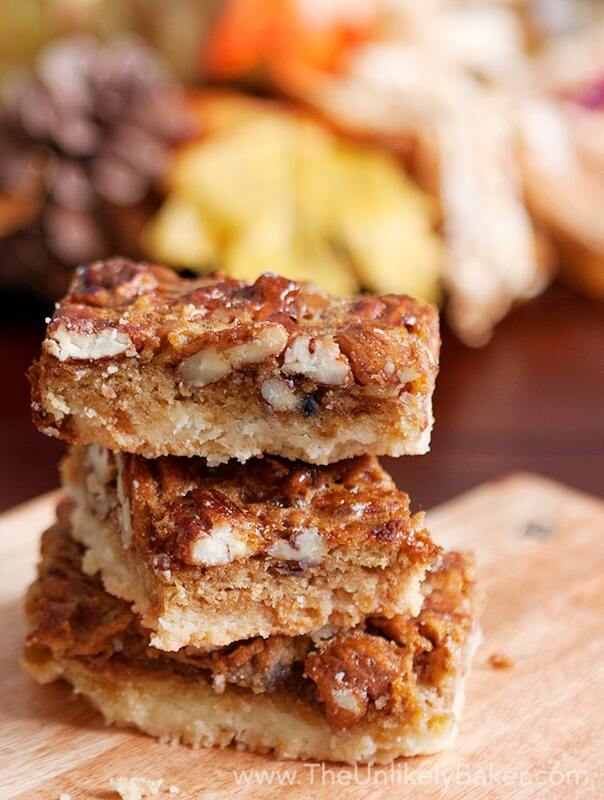 These are the little guilty pleasures in life…lol Thanks for sharing the recipe with us! Love how you decorated the cake…so neatly. I am not so good at that.What I love about no-bakes-, no-cooks is that you literally have to just toss in the ingredients. Thanks Anvita! I love that about no-bake desserts too 🙂 And also not having to deal with the oven in the summer 🙂 Happy Sunday! My list for no-bake stuff is getting longer. I need to put this Chocolate mousse pie on top. Looks heavenly! Too funny! 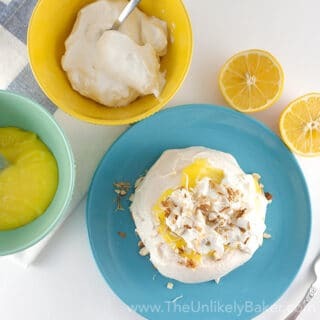 I have a list of no-bake stuff too! It’s getting a little too hot here to be cooped up in in a small kitchen with the oven on 🙂 This is really easy peasy. Hope you like it. Thanks Jessica! My younger brother`s birthday is next week! The pie looks delicious. I don`t know where to get Irish cream though. Oh yum! I love the taste of Bailey’s! This sounds like a delicious dessert and it’s so pretty. Hi Joanna! Now THAT is a great idea. I know Godiva makes this exquisite one. Chocolate overload! 🙂 Would love to hear about how that goes 🙂 Happy Sunday! Thanks Ahmed! This is really a very simply and easy recipe 🙂 Hope you like it! That looks awesome! Happy St. Paddy’s day and Happy birthday to your brother! Thanks Robin! Happy St. Patrick’s Day to you too! This looks amazing!! I can’t wait to make it! I don’t drink so what would you add instead of the Baileys? Hahahah you got me laughing out loud 🙂 Hope you enjoy it! Will gonna try baking this Bailey for my daughter’s grad cake. Goodluck to me! I’ll take a boozy recipe over a green one any day! This looks really yummy! Nice photo’s too! ME. TOO. Lol! Have a fun St. Patrick’s Day. Oreos, Baileys and it’s no bake?! This is perfection!